The Australian Government put a proposal to the World Heritage Committee to de-list 74,000 hectares of the Tasmanian Wilderness World Heritage Area. In its 38th Session held in Doha, Qatar, the World Heritage Committee unanimously rejected the proposal. The Committee took less than 10 minutes to reach a decision. Delegates from three countries, Portugal, Germany and Colombia, spoke against the proposal. ARCS was officially represented at the meeting by a delegation headed by Alec Marr, Director of our International World Heritage Programme, and Peter Hitchcock, an expert on World Heritage matters, Lincoln Siliakus, an international legal expert with World Heritage experience, and Jenny Webber who has expert knowledge of the Tasmanian WHA. 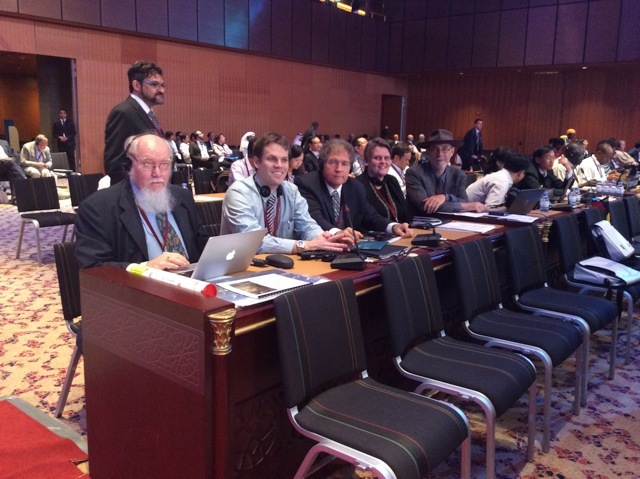 The ARCS delegation at the World Heritage Committee meeting in Doha, Qatar, June 15 – 25. Left to right: Peter Hitchcock, Lincoln Siliakus, Alec Marr (Director of ARCS International World Heritage Programme) and Jenny Webber. The delegation was supported by a detailed submission to the World Heritage Committee, “Why the Australian proposal for de-listing parts of the Tasmanian Wilderness World Heritage Area should be rejected”, prepared by World Heritage experts and endorsed by expert scientists including Peter Hitchcock AM, Adjunct Associate Professor Peter Valentine, William Laurance, Distinguished Research Professor and Australian Laureate Fellow, James Kirkpatrick, Distinguished Professor of Geography and Environment Studies, Dr Aila Keto AO, ARCS President and Sean Cadman, environmental consultant. The report showed the Australian submission was misleading in claiming that the area proposed for de-listing was degraded. In fact, less than 10 per cent had been logged, the remainder being in excellent condition. A major point made by the Government was that the area contained plantations of pine and eucalypt. The area of pine plantation is 80 square metres and the eucalypt plantation area is just 8 hectares or 0.01 per cent of the proposed excision. It is clear that the real reason for the proposed de-listing was to allow logging. Prime Minister Tony Abbott has declared that too many of Australia’s forests are “locked up” and vowed to set up a new advisory council to support the timber industry. Speaking at a timber industry dinner in Canberra last night, Mr Abbott also recommitted to repealing part of Tasmania’s Wilderness World Heritage Area made under the forest peace deal. His comments have prompted anger from the Greens, who have labelled him the “dig it up, cut it down Prime Minister”. The Government has formally asked the World Heritage Committee to delist 74,000 hectares – a position Mr Abbott reaffirmed last night. “We don’t support, as a Government and as a Coalition, further lock-ups of our forests. We just don’t support it,” Mr Abbott said. “We have quite enough national parks. We have quite enough locked up forests already. In fact, in an important respect, we have too much locked up forest. “Why should we lock up as some sort of World Heritage sanctuary country that has been logged, degraded or planted for timber? Mr Abbott told the dinner that Tasmania’s forest workers have a friend in Canberra. “When I look out tonight at an audience of people who work with timber, who work in forests, I don’t see people who are environmental vandals; I see people who are the ultimate conservationists,” he said. But Tasmania’s Deputy Premier, Bryan Green, says Mr Abbott’s approach to the issue is a step backwards for the timber industry, and a return to the logging war between activists and timber workers. He told ABC Local Radio the best way forward is through the treaty struck by environmentalists and the industry – the Tasmanian Forestry Agreement (TFA). “We’ve taken massive steps forward in this industry as a result of the TFA, we’re backing the TFA, we don’t want to return to the trenches,” he said. “We want to continue to diversify the economy, we want to grow the forest industry based on the TFA as it’s established. Greens leader Christine Milne says the Prime Minister’s words send a clear message to the world “that Australia does not value its world heritage areas or its national parks”. “People are going to be pretty upset that Tony Abbott is mounting this massive assault on the environment,” she said. Any move to repeal the World Heritage classification on Tasmanian forests would ultimately prove destructive to the state’s logging industry, she added. “Tony Abbott has got it so wrong. The logging industry was on its knees in Tasmania because around the world nobody wants to buy timber products that come from old growth forest,” she said. Senator Milne said the recent peace deal with Tasmania’s conservation movement had given loggers “some chance of a future in the plantations”, but that Mr Abbott had threatened to “send Tasmania back to decades of conflict”. “What he’ll actually do is destroy the forest industry, not to mention Tasmania’s clean, green and clever brand which is our main asset and that comes from our World Heritage area,” she said. Mr Abbott also used his address to criticise the Tasmanian Greens for everything from the state’s ailing economy to its poor educational outcomes. “We all know Tasmania has the lowest wages in Australia, it has the lowest GDP per head, it’s got the lowest life expectancy, it’s got the lowest educational retainment in the country and it’s got the highest unemployment, and funnily enough for the last eight years it has had a government in large measure dominated by the Greens,” he said. 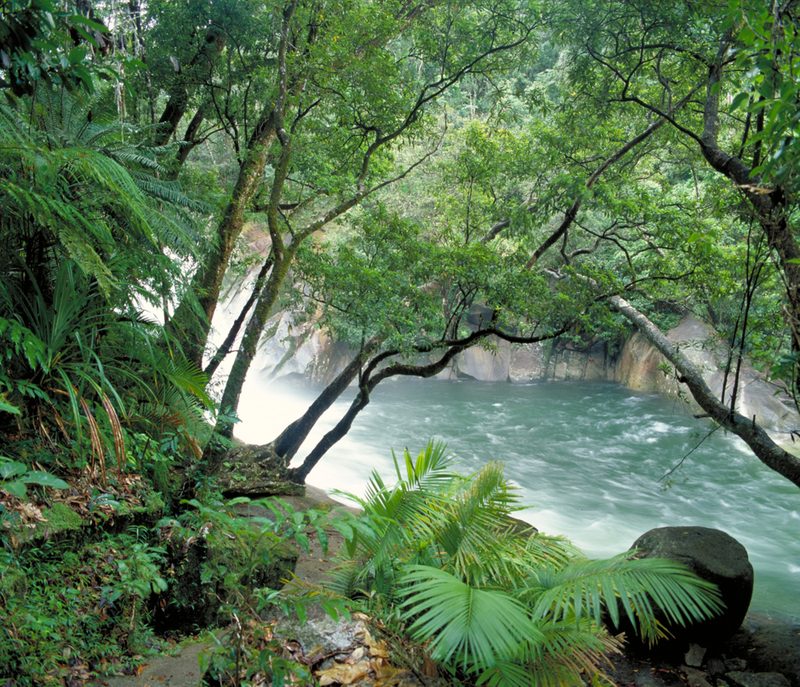 Today is the 25th anniversary of the World Heritage Listing of the Wet Tropics. It is one of the most important, irreplaceable natural areas on Earth. It is fitting to celebrate this milestone by our very first blog as ‘winning the Wet Tropics’ was why and how ARCS began. 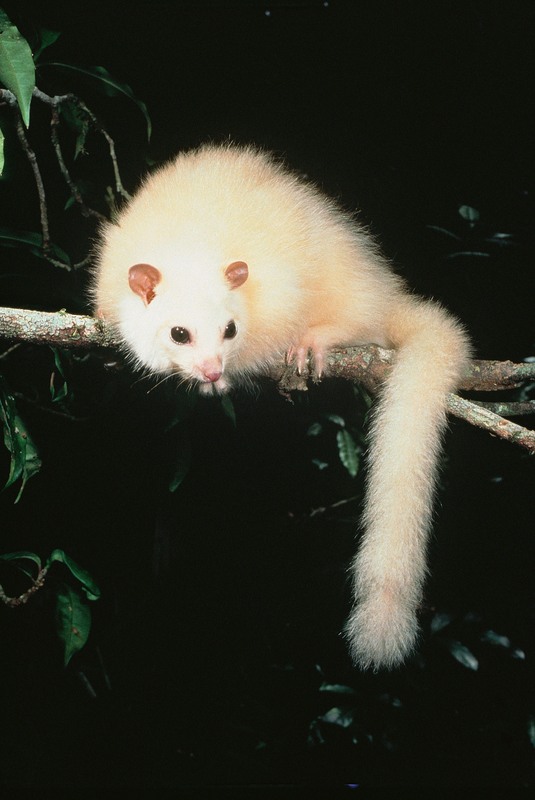 The campaign to protect the Wet Tropics was one of the most significant in Australia’s history. At stake was what James Thorsell (the official IUCN assessor of World Heritage nominations) later rated in the top 10 World Heritage sites. Very little was protected then. 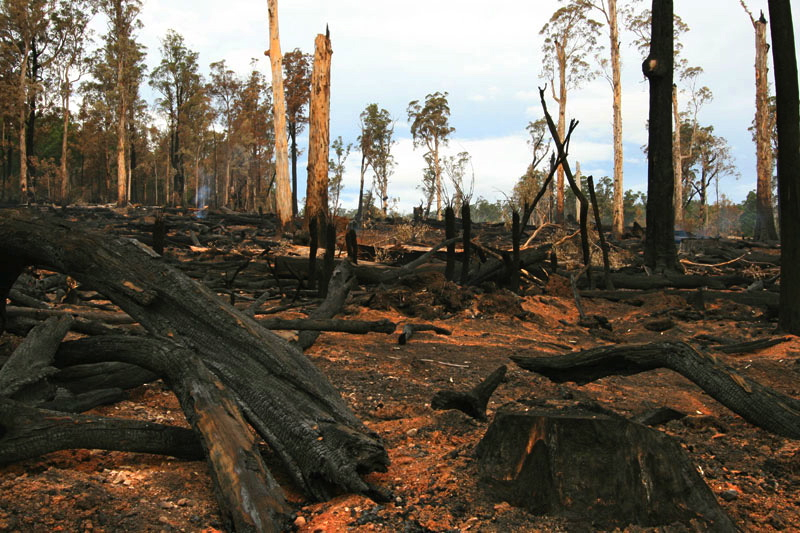 Industrial logging was reaching the last accessible areas of untouched forests. What was it all about? How was it won? What was its legacy? What lessons are there for today and the future? This was the classic “tragedy of the commons” — human short-term self-interest at the expense of the public interest (protecting an area of outstanding universal significance). Double-eyed Fig-Parrot, Golden Bowerbird, Lumholtz’s Tree-kangaroo. Reams have been written, but most notably by the late Nobel laureate, Elinor Ostrom and her colleagues, on how NOT to keep repeating this “tragedy of the commons”. That collective knowledge from around the world has been distilled into a resilience decision framework that we find invaluable. Our conceptual model of the drivers of change is inspired by that framework but concentrates on what most affects the Earth’s sustainability — its social, economic and environmental well-being. Society automatically organizes itself into and functions through these three types of institutions. At the apex are the formal institutions or structures that set and enforce the rules governing what happens in society — the policies, laws, regulations, the courts etc. The economic institutions organize and drive the use (or abuse) of nature (what some call ecosystem services). They are motivated by profit and economic growth, which if not moderated by “collective choice rules and processes”, and “graduated sanctions” undermine sustainability. In this instance I focus on the timber industry and its industry association. Both have long held disproportionate political power and harbored a long culture of entitlement. The third pillar, civic institutions, is the ultimate driver of social change. 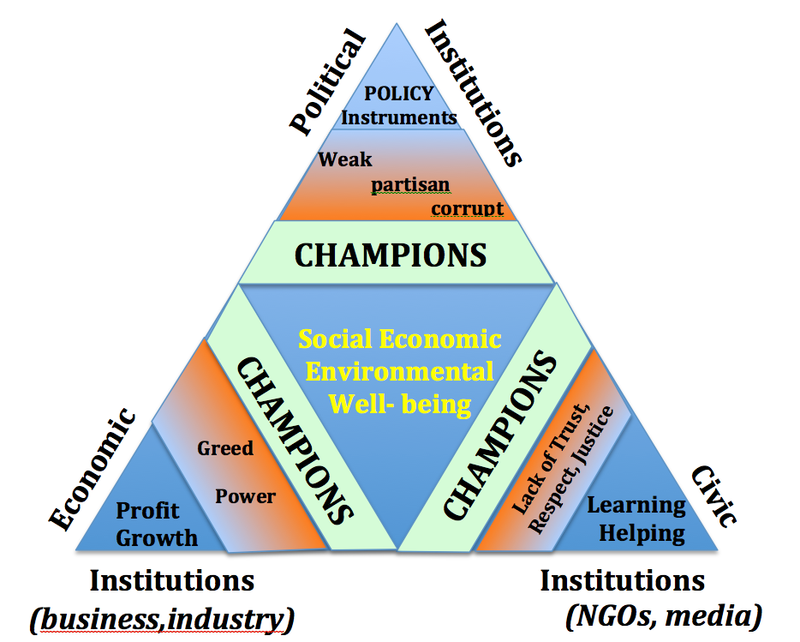 These three groupings (political, economic and civic institutions) need to work effectively together to achieve that holy grail of sustainability. They do not. Otherwise we would not have the sixth greatest extinction crisis in earth’s long history. Barriers to change are huge and overcoming them is what campaigns are about. This was the era of Joh Bjelke-Petersen. We tried our best but the barriers proved insurmountable. The policy instruments for environmental sustainability were weak. There was a strongly partisan political culture that favoured the timber industry; the Forestry Department was a classically captured bureaucracy; corruption was endemic in some parts of the government; and there were no champions for change — the conservation bureaucracy was essentially compliant or intimidated into silence. Civic institutions (NGOs) initially did not have the power or unity to mobilise public opinion enough to change the government’s mind. It was a time in Queensland when free speech and assembly were often prohibited. The Joh Bjelke-Petersen Government established the notorious police “Special Branch” to spy on community leaders and active dissent frequently met violent physical force from police. This context presented seemingly insurmountable challenges — especially if protecting nearly a million hectares of forests meant shutting down a rainforest timber industry that was being promoted as the model for the rest of the world. Despite all the risks involved, protests gained momentum buying time to explore other alternative fronts to achieve change. Our only other hope was with the newly elected Federal Labor government. Two factors were cause for optimism. (1) Bob Hawke had just been elected on 5 March 1983 on the promise of saving the Franklin and (2) the High Court on 1 July made a historic landmark ruling in the Tasmanian Dams Case. It validated the new World Heritage Properties Conservation Act Barry Cohen had introduced into Parliament on 21 April and which became law on 22 May 1983. The Act was necessary to protect the Tasmanian Wilderness World Heritage Area listed only the previous year in 1982. Listing followed by the new WHPC Act were the crucial keys allowing federal constitutional powers to be validly applied. Based on this model we urgently needed to assess and establish the World Heritage values of the Wet Tropics. The Australian Heritage Commission was a critical ‘champion’ for change. It commissioned and published our report, positively reviewed by international experts, and in September 1984 officially recommended the Federal Government proceed to World Heritage nomination. It was unclear what tactics would be effective as federal and state politics were becoming very murky. Disastrous by-elections for Federal Labor made prospects for re-election gloomy. Joh’s strong win at the 1986 state election massively consolidated National Party power stirring his ambitions for PM. Joh’s infamous push for Canberra however split the federal coalition with Ian Sinclair (Deputy leader of the Opposition) tearing up the coalition deal. To capitalize on opposition disunity Hawke called an early, double-dissolution election on 11 July 1987 and won an unlikely increased majority, mainly with the help of swinging voters in Queensland, and having also promised to save the “Daintree”. Arguably and perversely, Joh won the election for Labor, and for the Wet Tropics. With conservative forces in disarray in both Queensland and nationally, and two new appointments to High court made the previous February, new environment minister Senator Graham Richardson accelerated the process for World Heritage listing of the Wet Tropics in earnest. ARCS was commissioned to write the nomination and help draw up the boundaries. Queensland’s opposition to the nomination greatly intensified. In August 1987 it established the Northern Rainforests Management Agency (NORMA); this was a front to bolster the international reputation of their logging model. This was a critical issue as the Forestry Department widely promoted logging in the Wet Tropics as a model for the rest of the world. We followed them to each and every international forum to present our contrary research findings — first at an ITTO congress in Indonesia, then a UNEP forum in Fiji, and finally at a World Resources Institute Colloquium in Washington, going head-to-head each time with Queensland’s logging champions. We gained vital credibility at each of these forums. We also employed journalist Gregg Borschmann and invited eminent British scientist and conservationist Dr Norman Myers to help communicate our message and inspire public support. The Federal Government finally publicly announced its intention to nominate on 11 December, formally presenting the nomination to the World Heritage Committee on 23 December 1987. Queensland immediately mounted a High Court challenge. ARCS was asked to help acquaint the Federal government’s top legal team with the values of the Wet Tropics with the help of Black Hawk helicopters. What an experience! So as not to compromise the listing, a regulation banning logging in the Wet tropics was made under the World Heritage Properties Conservation Act on 20 January 1988. A Structural Adjustment Package of $75.3 million, to ensure natural justice for those affected, was in place by April. Without Senator Graham Richardson as the new environment minister, the Wet Tropics would not have been won. His courage facing the angry loggers at Ravenshoe is legendary and his power base politically was undisputed. Queensland, in response, established a new anti-listing alliance, including all Shire Councils in the area, and funded a 19-person delegation to tour the world in June 1988 with the intention of intimidating the World Heritage Bureau and Committee and its evaluating partner, the IUCN — but to no avail. Staying a step ahead globally, though, was a challenge for our small organisation. That involved my flying to the IUCN World Congress in Costa Rica to block any backward slides. We also enlisted the help of Gough Whitlam (Prime Minister of Australia 1972–1975) who had been Ambassador to UNESCO (1983-1986). He was also chair of the National Gallery of Australia (1987–1990) while I was a member of its board. His international standing was immense (He chaired the General Assembly of the World Heritage Convention in 1989.). The WH Bureau meeting in June 1988 recommended inscription but wanted clarification on some boundary issues and management arrangements. ARCS assisted a new review team that reported to the Bureau in September. Graham Richardson was getting ‘wobbly’. Long, 6-hour meetings with him resolved his concerns. The nomination was resubmitted in October 1988. Graham Richardson, Gough Whitlam, and I as their official advisor, attended the World Heritage Committee meeting in Brasilia on 9 December 1988 to safeguard the official listing from any last minute challenges from Queensland. The High Court thankfully rejected the Queensland Government’s legal challenge on 30 June 1989. During initial hearings, Justice Mason described Queensland’s case as “Alice in Wonderland”. In December 1989 Labor, led by Wayne Goss, won office in Queensland after nearly 20 years of conservative rule and, as a final step in the long saga, withdrew the government’s High Court challenge to the logging ban. ARCS helped design the new management arrangements (the Wet Tropics Management Authority), its statutory head of power (the Wet Tropics World Heritage Protection and Management Act 1993) as well as its resourcing needs that were instituted in 1990. I was an inaugural member of the Board of Directors of the new Authority for the period 1990–1997 to help bed it down to face enormous challenges. This was an essential part of achieving sustainability. The legislation defining its role and powers came into effect in 1993. None of this would have happened without pressure from the third pillar of social change— the civic institutions (e.g. conservation organisations and the media). Being less constrained, they are potentially the most powerful agents and catalysts of real change. Our effectiveness is built on generating trust and respect, on our engaging the wider community through social learning and empowerment. But in communicating urgent crises (even those that are dire) it is vital to keep alive the belief that change is possible. ARCS invested enormously in research, networking with the world’s scientific experts, and in bridging connections between the various national, state and regional conservation groups. In 1987 we employed successful and highly respected journalist Greg Borschmann and invited eminent British scientist and conservationist Dr Norman Myers to help inspire the public. Equally, so many other individuals and organisations committed a decade of their lives, mostly at great cost, in defense of the Wet Tropics. The nation-wide campaign resonated with the community to build that vital legitimacy for changes that followed. A vital factor in the campaign’s success was having champions at every level —those individuals with courage and vision, in the Australian Heritage Commission, Graham Richardson at the political level, and journalists – those true to their profession’s fundamental ideals of reporting the truth without fear or favour. Without them even the most powerful policy instruments would not have been enough nor could the public have been mobilized. But, above all, without the many courageous, tenacious individuals, whether the many leaders in the conservation movement or ordinary people who took serious risks and put their lives on hold for Nature’s sake, nothing would have been achieved. Without the success of the Wet Tropics, the South East Queensland Forests Agreement (SEQFA) would not have been possible. If the focus had only been on the Daintree as was the original plan, World Heritage listing (1988) would have failed, the rainforest logging industry would still be entrenched, and the SEQFA (1999) and Delbessie Agreement for statewide leasehold land reforms would not have been possible. All depended on historically built credibility and proven effectiveness. There are seven ‘learnings’ from the Wet Tropics campaign that are still relevant today. The most critical is “never lose sight of what nature needs”. (1) Champions are essential but not sufficient. In the case of Delbessie: with Peter Kenny as champion gone, insular short-term factors now dominate and AgForce is ready to ditch the Agreement they signed. The failure was in not bringing his constituency fully along with him. That’s something Rod McInnes, Chief Executive of Timber Queensland also needed to heed. (2) Timing — Not all objectives need to be achieved at once. Whereas non-partisan support at all levels is essential for enduring gains, it takes time to build that consensus. Opportunities must be seized when they emerge, else they may never come again. In the Wet Tropics the industry and the Queensland government made themselves irrelevant in the short to medium term. In the SEQFA the federal government became irrelevant because it was partisan and intractable in its determination to preserve the timber industry unchanged. (3) Unceasing vigilance is critical. At every step, there were powerful forces trying to undermine progress, e.g. Queensland’s Rainforest Conservation Program. During the SEQFA, it was the National Association of Forest Industries (NAFI) and Wilson ‘ironbar’ Tuckey, the then Federal Minister for Forestry and Conservation (1998-2001). (4) Passion, patience, persistence — the three vital Ps. Most campaigns take years (for ARCS, up to 10 years or more); if you don’t feel passionately about things, you won’t last the distance. Patience is vital, especially when we are so distracted by the pace and complexity of this modern world and expect ‘instant’ success. Persistence is the essence of success — learning from failure, being there at the right place and time. Even when things seem impossible, one has to grit one’s teeth, bide time, and keep building capacity for the next window of opportunity. Things often happen out of the blue. Being clear about one’s long-term goals but open to exploring many different ways of getting there is important — being ready to seize new, unexpected ways or hidden opportunities to achieve change. (6) Respect: everyone’s efforts count — no matter how small. Networks and partnerships all depend on trust and respect. Movements for change can fail for the want of it. (7) Nature’s need: the hardest of all to learn. It may seem impossible at first to deliver — we may lack the resources, vision or the courage, but we should do our best and never lose sight of what nature really needs, then do our utmost to deliver it. Often, there is no second chance.